Bank Compliant, Network Ready, Secure & Fast! Print high-quality bank compliant checks & documents! Features 40,000 pages per month duty cycle, and high speed 27ppm! *With $700 min purchase of any combination of software, toner, ink and paper. 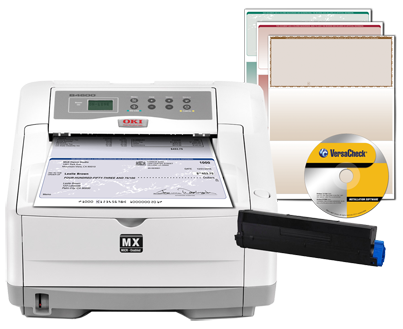 The B4600nMX Secure MICR Solution is a bank compliant, network ready and secure check & document printing system. The B4600nMX MICR Solution is built for efficiency and speed, with expandability to meet your future needs. If you're looking to improve the productivity and lower the operating costs of your business, the B4600nMX MICR Solution Digital Monochrome printers are made for you. The B4600nMX delivers up to 27 ppm, with the first page printing in as little as 5.0 seconds1. Black & white output is clear and crisp with 600 x 2400 dpi resolution, using a two-piece consumables system for long-lasting, high quality performance and a low cost of operation. In terms of durability, B4600nMX printers are tough-with a monthly duty cycle of 40,000 pages this printer is ideal for any work environment. B4600nMX printers, with their compact size, stylish lines-fit just about anywhere. PCL® 5e and PCL® 6 emulation is standard. The B4600nMX performs equally well with the most popular Windows® operating systems and Mac® OS X.3 and higher. With USB, parallel, and Ethernet (via included OkiLAN print server card) interfaces, B4600nMX printers offer broad-based connectivity.